All the whining, crying, tantrums, potty training. That’s what most toddlers are about, but not the Abrasive Rock fest! Okay, some of that other stuff might happen, but it’ll be you after you catch a load of this line-up if you miss it. This is a yearly Abrasive Rock fest that is for those that like some variety. And yes, this is a toddler, just the second year. Some metal, some punk, some industrial, a little progressive, some thrash. Hey a little bit of everything for everyone. 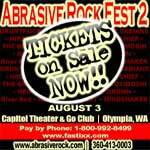 Held in Olympia Washington, August 3rd, it’s a great alternative to some other hard music fests that just don’t cut it anymore. It starts at noon as an all ages show, then ends with an after-hours unsigned show, that’s -- you guessed it -- 21 and over. They even allow re-entry so you can visit the bars down the street, and there’s at least ten to choose from. This is held in the Capital Theatre downtown Olympia, 205 Fifth Avenue Southeast. Tickets are still available, by contacting 1-800-922-TIXX. Otherwise they are on sale at some local spots in Washington, namely CD Connection- 1-360-413-9118. Tickets are $25.00 for hour after hour of music! If you have any further questions contact AbrasiveRock.com.